Feb. 1, 2016, © Leeham Co. Ouch. Boeing stock tanked about 10% last Wednesday when the company surprised analysts with unexpected news and below expectations 2016 guidance. 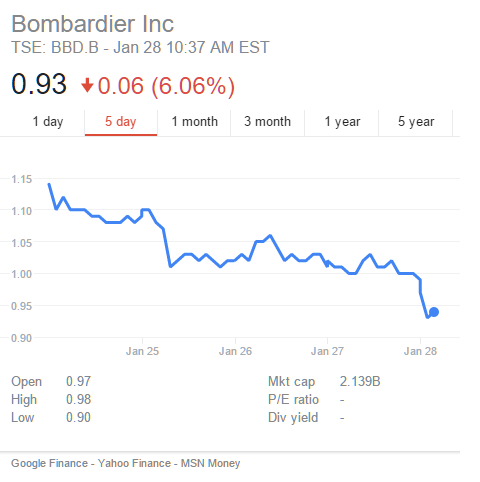 Bombardier became a penny stock. For the behemoth airframe manufacturer, the “Street” doesn’t like negative surprises. And Boeing did just that. I report on this in my new column for Forbes on-line, posted right after the second attempt at the earnings call. Since that posting, I’ve talked with an analyst who, with mounting frustration, asked, “How could Boeing give guidance that was $1.20 [per share] below consensus? They knew the 737 MAX was going to go through the same thing as the 777X. As recently as October they were saying it wouldn’t. Boeing stock tanked on earnings call day last week on negative surprises and guiding lower than expectations. Screen shot of the day after. Click on image to enlarge. Indeed, the question about the MAX is particularly salient. Last year, in the pre-Paris Air Show media briefings, Boeing explained that as it pulled down the production rate of the 777 to 7/mo (making last week’s announcement on this point rather superfluous), officials gave a muddled explanation about “shooting blanks” that befuddled journalists and even respected aerospace analyst Richard Aboulafia. But the point is this: Boeing said that despite the rate reduction, the all-important deliveries would not match production during the transition. It was a point lost on most of the journalists, although some Wall Street analysts correctly picked up the nuance from news reports and factored this in to their subsequent research notes. This alone should have given the analysts a clue that something similar would occur with MAX—but it didn’t. Neither did Boeing rise to the occasion, after the scathing and confused press reports about the 777 transition—and begin to lay the groundwork with the MAX transition. To its credit, officials last week gave a clear and concise reason why there will be fewer 737 deliveries this year than in 2015. As more MAX test and early production MAXes come off the line for testing, certification and delivery in 2017, these take up production slots. Despite more than $2bn in new funding and a new executive team, BBD still hasn’t won a new order for its C Series in nearly a year and a half—not even converting MOUs and LOIs to firm orders. 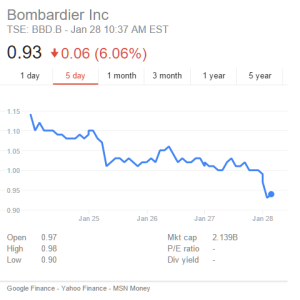 Bombardier became a penny stock last week as investor confidence continues to fall. Click on image to enlarge. Horizon Air, the sibling to the USA’s Alaska Airlines, said it will let 15 Q400s go at the end of the lease terms and replace them with jets. These will be most likely Embraer E-175s, which offer a superior passenger experience than BBD’s competing CRJ900. For Alaska, pitched in an intense market share battle with Delta Air Lines, the passenger experience is of keen importance. BBD’s public desire for another $1bn from the Canadian national government says the company is still in financial stress. The government’s torpedoing of restructuring the agreement banning commercial jet service at Toronto’s downtown airport sinks a conditional order from Porter Airlines for the C Series. All-in-all, market confidence in BBD remains ice-thin. The fall into penny stock territory illustrates this. Not exactly fair to Trudeau: The idea of having the C100 at the Island airport has been highly controversial. Forgotten is that its use would require an extension of the single runway at the island airport and that into a bay heavily used by sailboats, ferries and merchant ships. I tend to agree with you that the issue could have been resolved – perhaps by changing the take-off profile or increasing thrust. Introduction of “jets” to the Island Airport was only controversial to a small number of leftists. The last time a poll was conducted – three years ago – a slight majority of Toronto residents were in FAVOR of “jets” at the Island Airport. As for approach profiles – the CSeries is certified for a steeper approach than the Q-400’s (it needed to be in order to serve London City Airport) so it would not interfere with the sail boats. BTW the most vocal opponents of “jets” are members of PRIVATE yacht clubs in the harbor who fear they will interfere with their summer recreation (which last about 4 months of the year). Sad to think of the thousands of jobs being sacrificed to satisfy these elitists. Mr. Trudeau is a Green in Liberal clothing. Exhibit 1 : As a Green he had committed before the election to sinking the re-opening of the tripartite agreement on Billy Bishop Airport. Exhibit 2 : Look at the current waffling on the Energy East pipeline. On the other hand, taking in 25 000 Syrian refugees will be a tremendous boost to the Canadian economy. @kevin, Do you have a link to the Air Canada statement? Aviation Week had an article on it a couple of weeks ago. Air Canada flying jets from the Island Airport would mean a C Series order as it is the only suitable jet. If the future of the c series depends on acquiescing to blackmail from a small airline,it’s doomed anyway.Everyone thinks it’s a nice plane,no one can find a compelling reason to buy it,at least for now. Grubbie, you’ve got a point. I mean, if one were ignorant of the situation and yet read the first few posts on this topic, one might think that the C-Series debacle hinged on whether or not a single airline should be allowed to operate jets at a small island airport. Well, we know that that the Cseries’ problems are more fundamental and profound than just the Porter Airport issue – and I think it’s about time that we all recognize that fact: the fact that as a commercial-aircraft development program, the Cseries has been a utter failure. The safe harbour to BBD’s ails resides in an opportune or at least desirable revison to the infamed “Scope Clause” which allows ALPA to be in command of strategic fleet planning of numerous Commuter and Regional airlines in the US who have their wrists ironcuffed and are impotent when it comes to upgrading the unit size of their fleets, limited to 76 seats e.g. @ United Express … With today’s Scope Clause renamed SC1 lifted to apply from 120 seats upwards, plus a new SC2 in two tiers (SC2A from 77 seats —> 99 seats, then SC2B from 100 seats —> 119 seats) to suit Regional/Commuter needs for larger aircraft, hundreds of aircraft types in the C100/SSJ100/E2 class would find their way into the US in the short term, a lifeline to BBD ? Interesting. Is it really effective ? Do you have more information about it? It’s my recipe to a solution, not a fact… Only infamed ‘Scope Clause’ exists, Scope Clause 2 (A and B) are idealisations yet to be projected, negotiated and implemented ie sophistications of the original accord United with ALPA. Scope Clause arrests fleet planning for Regional and Commuter airlines at unit size max = 76 seats. When a regional route matures, calling for a larger module, then the Mainline steps in with its pilots and equipment (A319, 737-700 …) to take over operations under Mainline employment terms, cutting off access for the Regional Airline. It’s done like in a hold-up ! A shame, actually … should be removed or improved upon ? For BBD, hope the new cnd PM Will do like Hollande and Merkel going in person to close deals for Airbus at major Air Shows. 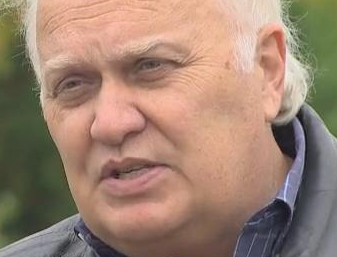 Previous cnd gvt didn’t even send any gvt ” big guns” to give potentiel BBD Customer the back room hand shales to help close deals at these Air Shows..
BBD won’t get any C-series orders for a year or so now, with it about to enter service, and a small backlog, anyone interested can wait and see how it does in service while still getting delivery of anything they order reasonably quickly. If the backlog was bigger it would put more pressure on customers to place orders but I think it will be all right in the long run as long as the aircraft performs as expected. The rest of BBDs commercial line up should be worrying them though, as both lines need replacement and there is no cash. Lack of CS100 and CS300 selling is a good thing : it will force Bombardier to leave earlier than planned a CS500 . So earlier ad for faster delivery! I think many analysts and stock owners find out that what big companies’ management communicate is largely in the interest of their management. It may be factually correct, but it can be embarrassing incomplete. Or create perceptions beyond reality. Or add powerful, subjective assumptions the average stockholder fails to value. I saw the Forbes article and wonder why real independent analysts such as Scott aren’t invited by Boeing for the earnings calls/ events. @keesje Boeing blacklists those who don’t drink the Kool Aid. is either the blacklist or the corresponding whitelist publicly available ( as guest list, … ) ? Well history is rife with the management theory that its best to kill the messenger! Fortunately todays version is to cut off access not a head, so we don’t have to be (too) concerned for Scott. It continues to be twisted on 737 production downturn. I can see the new build 737MAX taking away from parts that would go to finish the current 737s if it was a static situation. Major Boeing parts not doing what they should or Spirit unable to respond? Both? But this was also supposed to be a ramp up year and the suppliers should have been supplying more complete kits anyway. First MAX do not get the complete outfit and the production of outside suppliers should cover low rate latter in the year as well as the ramp up. And yes why is the 767 going down in production? If Boeing starts to go into tanker production ( starting out as basic 767 frames ) these won’t be delivered near term. They’ll be on Boeing’s hands and books for a year or longer. Anyone know if BCA gets paid for when they turn one over to Boeing Tanker Conversion group? 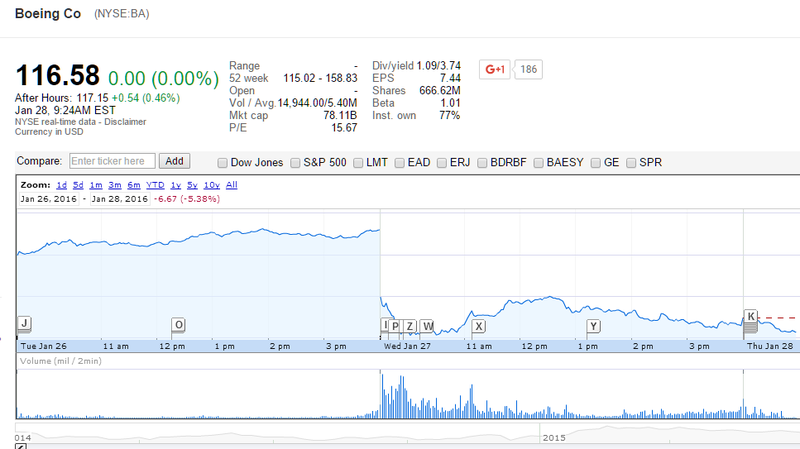 Go figure, Boeing stock ended up @ 121.60. It’s already made up about half of last week’s loss. And it could loose it all tomorrow. Investors don’t like companies that have big swings. Stock Traders in the banks surf on swings and make Billions overnight playing the front gradients, using instant trend modelling software. Banker’s Golden Boys love those upsn’downs ! Agreed, I am talking about investors not gamblers. Sadly the Stock Market6 is now a huge gamboling machine. Chumps are supposed to stay the course while gamblers manipulate it and play the numbers. More likely it’s the start of a recovery from a three month decline as investors see an opportunity. I found this interesting comment from an unnamed airline pilot who explained why United’s recent 737 order does NOT spell bad news for the C Series. It seems the media completely misrepresented the significance of this order. To put an end to the ‘scope choke’ and make everybody happy, FT included, I recommend for United to put in an order for 200+ H19QR units sine die, fitting it with ample Premium 1+2+1 and half a duzin rows of E+ 1+3+1 @ 34″, that’ll suit the NSNB definition in the scope clause extension. I doubt however if this solution would please Alain Bellemare ? Good catch, I had missed that one. So despite being overbooked its still possible that they can’t move slots around and maintain current production. New wing, landing gear and fuselage stretch and we have 737/757/A321 competitor. I have wondered if they redid the wing box if they could not get it higher, interesting to see what happens. I am very interested to see what happens. As an investor, BA’s $14Bn in stock buybacks infuriates me. Imagine what could be happening with the NSA and mid-size Twin Aisle aircraft development if that money was invested in R&D, development studies, test projects, etc. Boeing has be totally Wall Streeted to think only short term, stock price, and making planes is just a means to a dividend. I think it is a horrible failure of leadership. What if that money is needed to finish development of 777x? 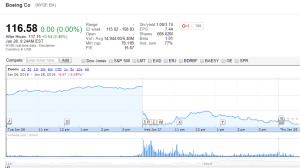 Quietly re-sell the buy back, the shares don’t go away, do they? Boeing just owns them. Shares are cancelled after the buyback. The main point of the share buyback is to decrease the number of outstanding shares, thus increasing income per share and propping up share price…. which, incidentally, is good for management share options. Thanks for the info, I thought they were just in the treasury. So that mean a whole new offer to sell more capital if needed? Pretty public, share price then goes down?